Our team of expert tree surgeons are qualified and experienced to work with trees of all shapes, sizes and heights. We offer a range of tree services from pruning and shaping, removal of branches and deadwood, to complete felling of trees. Our team are available throughout the year for both one-off assignments and regular or contracted maintenance with domestic and commercial clients. Prior to any tree work, we will assess the overall condition of a tree and carry out a safety assessment to identify any potential hazards and ensure that work can be undertaken with the minimum of risk to both staff, properties and surrounding areas. It is essential that debris and branches are removed in a controlled manner. 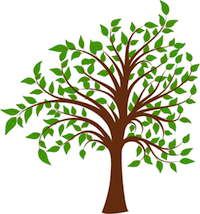 Please be aware that you should abide by your local planning and conservation laws and determine if a given tree is subject to a tree preservation order or if your property is within a conservation area. Please see our important information section for further details or contact us to discuss. Please feel free to contact us to discuss your specific requirements or arrange a free, no obligation, site visit. We can prune and reshape trees and shrubs of all heights and sizes. By trimming and tidying we can maintain healthy growth and produce a desirable shape. We can undertake formative pruning of younger trees and shrubs to promote healthy growth in the future. As part of our survey, we will determine potential issues and weaknesses (e.g., crossing of branches as a tree develops) and rectify such issues at an early stage. By cutting branches back whilst retaining a tree's natural appearance, we can achieve a uniform, balanced and well-maintained reduction in the size of the tree crown. A crown reduction may be required for a number of reasons including reducing wind resistance, managing water uptake and to control the growth of the tree in restricted areas. This technique can also permit more light to enter a garden or property. Crown reductions can involve the removal of large amounts of tree materials but the focus on maintaining a tree's natural shape and achieving a uniform reduction means the end result may show minimal evidence of the recent work. Similar to crown reduction, thinning of the crown through the selective removal of smaller, live branches and complete removal of dead or damaged wood will reduce wind resistance and allow more light. By reducing the density of the crown, foliage of the tree will be well-spaced and weight on heavy limbs will be reduced. Unlike crown reduction, crown thinning will not alter the overall size or previous shape of the tree. To clear lower branches from pathways and roads, we can undertake crown lifting. This technique involves the removal of lower branches effectively increasing the distance between the crown and ground level. Crown lifting can be undertaken for both safety and aesthetic reasons allowing greater access to the base of the tree and more light to enter a garden area. As part of the general healthy maintenance of trees, hedges and shrubs, we can remove dead wood and clean out the crowns of trees. Dead wood removal is an important aspect of tree management especially with large trees as falling wood and branches can be a hazard to the public, vehicles and properties. Coppicing of trees is a traditional method of tree and woodland management that involves cutting trees back to their stump or roots. Coppicing can only be undertaken on selected species of trees but the method promotes fresh growth in these species. Coppicing is normally undertaken on a regular cycle (every 10 to 30 years). Pollarding is a technique to promote dense heads and regrowth of foliage and branches. The technique involves the removal of tree branches back to the trunk and is undertaken in cycles of various lengths depending on the species of tree and arboriculturals requirements. We have experience in removing a wide range of trees in a variety of locations. Depending on available space and site-specific risks, we will employ the safest possible approach to removing and dismantling a given tree. Much of our work involves the removal of limbs, branches and entire trees which are located near, or over-hanging, properties. To achieve the best management of this work we employ controlled lowering systems to manage the descent of removed materials. This approach allows the crew to work safely and efficiently whilst managing and minimising potential risk to the surrounding environment. On occasion it is necessary to undertake emergency tree and branch removal or remedial work. Our team is available at short notice to carry out such work. Please feel free to contact us directly. When trees are felled, tree stumps can be left in situ or be removed completely. We can arrange for tree stumps to be removed through winching or through the use of stump grinding machinery. Please feel free to contact us to discuss options. As well as general tree maintenance we are able to fulfil complete site clearances including removal of all trees, shrubs and bushes prior to full re-development of an area. Further details are available in our garden services section. The use of power tools such as chainsaws can be noisy and disruptive but a surprising amount of arboricultural work is undertaken with minimum noise using hand tools only. This approach is often a preferred technique as it allows for precise cuts and managed noise during tree work. Although we may be working in close proximity to your home or property we aim to allow you to continue your day or business as usual.